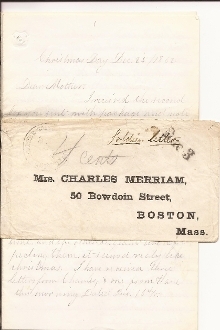 Soldier's Letter, 10 pages, 8vo., "Christmas Day Dec. 25/ 1862". Herbert Merriam (Co. H, 44th Massachusetts Infantry) writes a detailed letter to his Mother pertaining to the Battle of Kinston, North Carolina. The enemy were on the opposite side of the river, the artillery were firing on them besides infantry..."
For full transcription of the letter, please see the scans. Fully legible pencil. Excellent content. Comes with the original postally used cover/ envelope which bears the unit's handstamp.